See Rep. Gipson’s article about the bill here. Allows churches to authorize armed “security” church members & offers a defense of statutory immunity of churches and those members from related civil liability if such members are enhanced permit qualified, and an additional defense (with burden on the accused member and NOT an exemption or immunity) to those members against criminal prosecution. Note that it’s already legal to CCW at a church with the enhanced permit or to open carry without a permit, and the bill does not speak to those actions outside of the new security teams, so I think the practical effect of this part of the bill is very minimal, and of no consequence at all for CCW with the enhanced permit. The liability limitation is new. Also, it seems that this bill allows the “authorized” members to CCW at church with no permit (if they want to give up the civil immunity). HOLSTER CARRY – This bill also now includes the open carry language (not related to churches) from HB 1352, that “No license shall be required under this section for a loaded or unloaded pistol or revolver carried upon the person in a sheath, belt holster or shoulder holster…” (”…or carried in a purse, handbag, satchel, other similar bag or briefcase or fully enclosed case”). 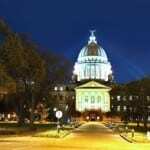 Prohibits enforcement by MS public employees of federal firearms laws which violate the Mississippi Constitution, with civil penalties and misdemeanor violations provided.